Here at Gardening on a Dime, we have a few different sunflowers planted this year. 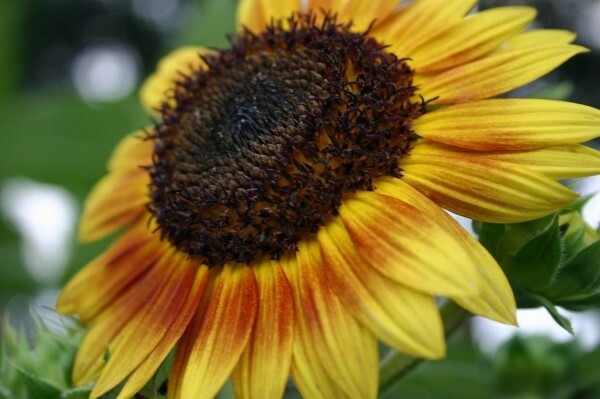 One of the seeds we found on clearance a couple of months ago at one of the big box stores was Autumn Beauty Sunflower. Figuring that for a quarter a packet, we had nothing to lose. And since our whole idea is to garden a little more economical, using the money saved for quality garden tools and toys, we plopped them into the ground and let nature have it’s way with them. Now it’s been a about six weeks and they have popped up to five or six feet tall and are starting to bloom. The Autumn Beauties are opening first. There are some Mammoth Russians and Lemon Queens following close behind them. We hope to enjoy those as well over the next couple of weeks. Years ago a tornado destroyed all the trees in the center of pour property. i grieved over the loss of my big shade trees, then that summer I was cheered to find a sunflower blooming cheerfully in my newly sunny front yard! I suppose a bird planted it, but since then sunflowers have been a symbol of hope and renewal to me. Yours are gorgeous! Thank you. I find them so simple, yet always inspiring.